There are rumors the day Emily Beam arrives at the Amherst School for Girls--- in January, halfway through her junior year. She doesn't look like the other girls,, who look like girls in magazines. She doesn't sound like them, either, and she wears different shoes. I do not say Ba-BUM, Ba-BUM. My comment: Emily has arrived at the new school after her boyfriend committed suicide in front of her at her other school. Now she is writing poetry as if she is channeling Emily Dickinson. I like the poetry part of the book. The book dedication says: "For the ones who stay." HelpUCover created a cool graphic of Memorable Animals in Literature. Cavalcade of Authors West is this Saturday. 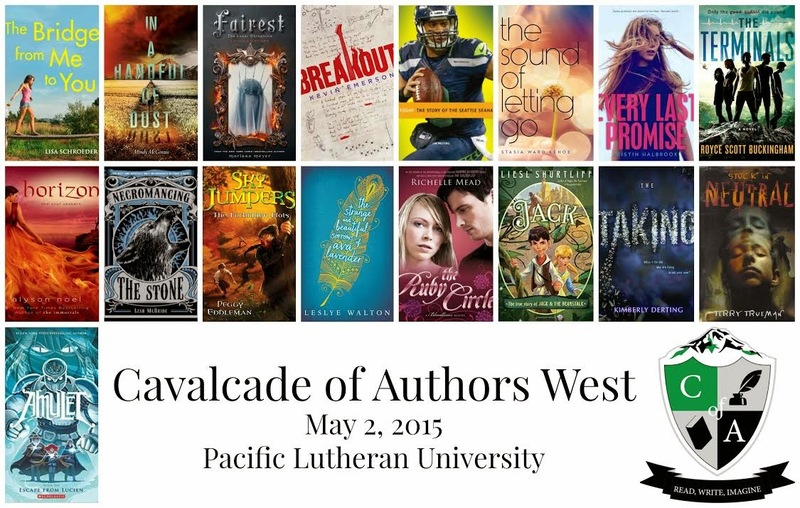 This coming Saturday, May 2nd is the first Cavalcade of Authors West (west of the Cascades). Seventeen Young Adult and Middle-Grade authors will converge on the campus of Pacific Lutheran University for a day of seminars, author panels, and book-signings. 20 students from each of the area high schools and middle schools were invited to attend. These students had to pay the registration fee, read books by a minimum of four of the authors, and get themselves to PLU on Saturday. Students were also invited to submit their writing samples to be judged by college students. Sorry about the poor quality of this photo. It is a copy of a copy of the handout given to potential participants in the writing contest. In case you can't read the authors names (imagine that!?) Here is a list of the authors and a few titles of their books. This is the first year of Cavalcade of Authors West. Apparently a similar event has been happening on the other side of the mountains for several years. I am sure that it will be a fantastic event and I am excited for Saturday. Pages read: 370 of 609. Weekly goal: I passed the halfway point. I managed to read 20 pages all but one day. 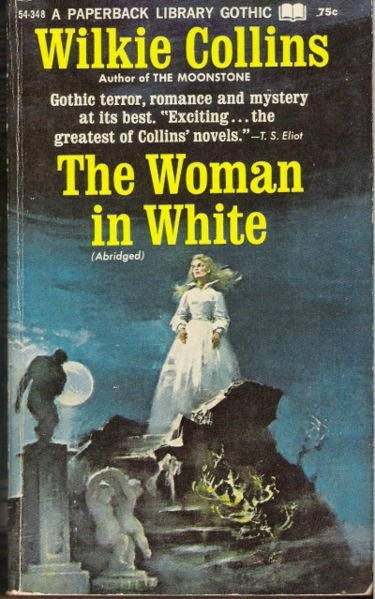 "What was the strange secret of the mysterious woman in white? What was the real identity of this ghostlike being? Was she sane - or mad? Was she living - or dead? And why did beautiful Laura Fairlie fear her presence in the dark corridors of Limmeridge House? The strange answers to these sinister questions haunt the thrilling pages of The Woman in White - Wilkie Collins' most brilliant Gothic novel!" Still enjoying the book and I am pleased with my progress. No one is what they appear to be at first glance. Sinister situations and people abound. The narrator has switched several times this week from Miss Holcomb, to her uncle, and now the housekeeper. Comments: the plot has me on pins and needles making me want to peek ahead to find out how everything turns out. No wonder fans stood in line to get the next installment of the story when it was originally serialized in a magazine. Today's Top Ten Tuesday topic: Characters Who _____ (are musically inclined, have lost someone, have depression, who grow up poor, etc.). I decided to select a tough subject. 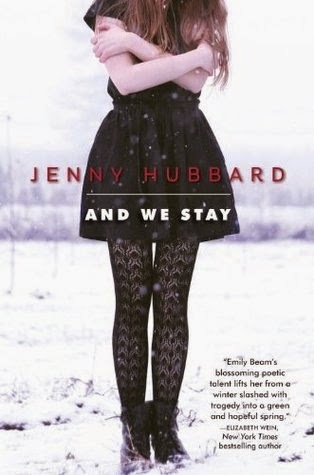 YA novels that feature characters who have triumphed despite parental neglect or addiction. Weather: overcast and threatening to rain. The weather turned this past week from sunny and warm to rainy, cold, and wet. This typical for this time of year in the Northwest, but no one likes it. Scouts honor: yesterday we attended an Eagle Scout Court of Honor for a friend's son who was earning his Eagle Scout award. In all my years I have never attended one of these events, nor have I really paid attention to the Scout Law by which they govern themselves. I was really touched by the whole ceremony and especially when their code was called out and explained. (See photo above.) Scouts are: trustworthy, loyal, helpful, friendly, courteous, kind, obedient, cheerful, thrifty, brave, clean, and reverent. If only we would all conduct ourselves this way. SBAC testing (Smarter Balanced Assessment test): partially closed the library this week. With fewer kids in the library, except for those taking the test, we had another quiet week. Sigh. Quiet libraries often mean low circulation. Prayers for: my friend who lost her brother to an accidental death. She and her family are all deeply grieving. 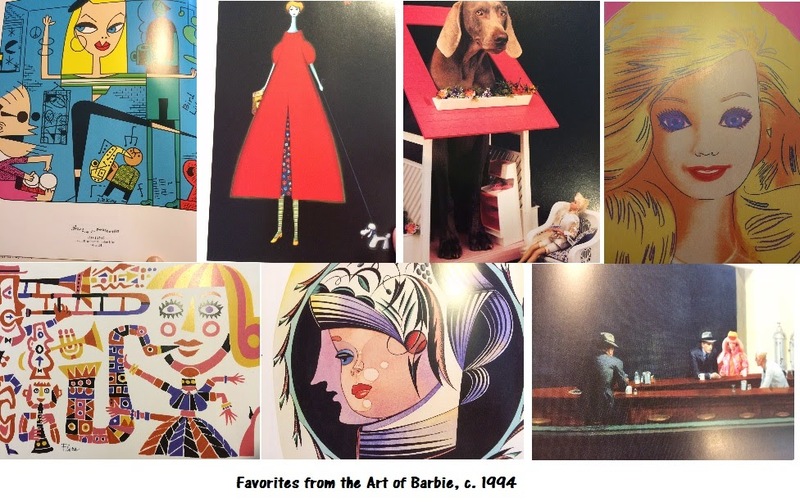 Books read this week: One only, The Art of Barbie Book by Craig Yoe. I picked this book up on the sale table at the public library for $4. Fifty artists and designers were asked to design a piece of work about or with Barbie. Being a big fan of the doll as I was growing up I just HAD to have it and loved it. What's So Amazing about Grace by Philip Yancey---this is for the adult Sunday School class I am co-teaching. insightful. 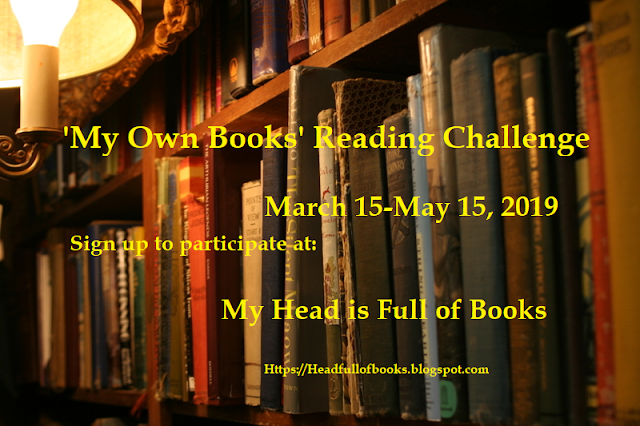 The Woman in White by Wilkie Collins---I am making good progress on this Classics Club challenge selection. The plot is very tense at this point. The Best Exotic Marigold Hotel by Deborah Moggach---my current audio selection. 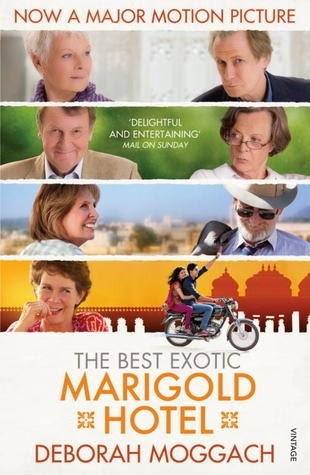 Speaking of The Best Exotic Marigold Hotel: we rented the 1st movie last night so that we could go see the Second Exotic Marigold Hotel today at the Grand Cinema (an independent theater.) The book is quite different than the movie but I am enjoying it, too. We arrived early yesterday evening at the Clover Park Technical College conference center to secure good seats to hear Daniel James Brown talk about his book, The Boys in the Boat: Nine Americans and Their Epic Quest for Gold in the 1936 Berlin Olympics. The author event, hosted by the Pierce County Library System and sponsored by The News Tribune (Tacoma's daily newspaper), was the culmination of the 2015 Pierce County Reads. Now in its 8th year, the library selects a title each spring for Pierce County Reads, then promotes reading and discussion by book groups, school and community groups, as well as sponsoring other special happenings related to the book's subjects and the pinnacle event with the book's author. We've attended many of these annual author evenings, but it's a good thing we arrived early last night because the place was packed with over 1400 readers waiting to hear Brown talk about his phenomenal book and the people and stories we shared through his writing. Georgia Lomax, executive director of the Pierce County Library System, kicked off the evening talking about her reaction to the book. 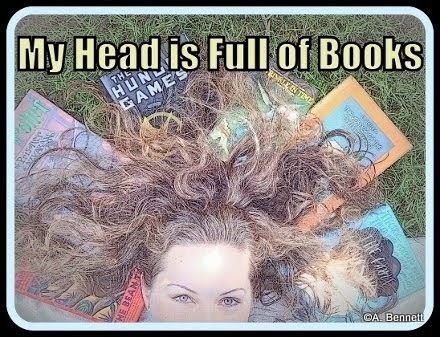 "I knew how the book ended up," she said, "but as I was reading it I wasn't so sure because the action was so tense." Everyone in the audience chuckled. We all felt the same way. We all knew the boys in the American boat were going to win their event at the Berlin Olympics -- it is in the history books after all -- but it sure didn't seem possible as we read the incredible details of the gold medal race. David Zeeck, publisher of The News Tribune, offered some context for Boys in the Boat and what it tells us about being from the Pacific Northwest. He reminded us what a special thing these young men; from Puyallup, Anacortes, Montesano, Sequim, and Deming; had accomplished. Especially important because Seattle seemed like such a remote outpost to most people in America in the 1930s (and perhaps still does for many today!). Daniel James Brown began his remarks describing a homeowner's association meeting. This seemed like a weird way to begin talking about his book, but we soon learned that's where he met Judy, the daughter of Joe Rantz, one of the nine members of the 1936 US Olympic crew team. Joe, who was over 90 at the time and on hospice care, had read one of Brown's earlier works and wanted to meet the author. Not long after meeting Joe started talking about his rowing experiences and Daniel wondered aloud if he could write Joe's story. "But not just about me. It has to be about the boat," he told the author. By "the boat" he didn't mean the crew shell -- The Husky Clipper -- he meant the boys in the boat, his teammates. As Brown talked about his research and writing, he also shared reactions from fans who send him e-mail. 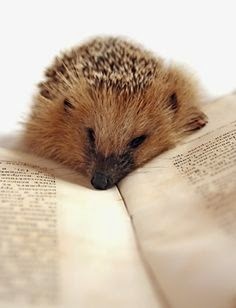 Several people informed him they thought reading a book about rowing would be really boring. But anyone who has read this book knows it's about so much more than rowing and crew races. In fact, Brown said, many themes exist in the book along side the incredible crew rowing story: life during the Great Depression; Joe Rantz's personal story of abandonment as a child and how he overcame his feelings of inadequacy; George Pocock, the best racing-shell builder of the day; building the Grand Coulee Dam; Joseph Goebbels and the German Ministry of Propaganda; and Leni Riefenstahl and her powerful propaganda films for the Third Reich. Midway through his talk, Brown showed us film footage from the Olympic finals race. The eight-man crew race begins at about 1:00 and the American boat is in the outer lane farthest from the camera. Shots taken inside the boats were filmed the day after the race and spliced into the footage. As the German and Italian crews approach the finish line, the American boat appears at the top of the frame, right at the end of the race, nosing out the narrowest margin of victory. Brown read us two selections from his book. 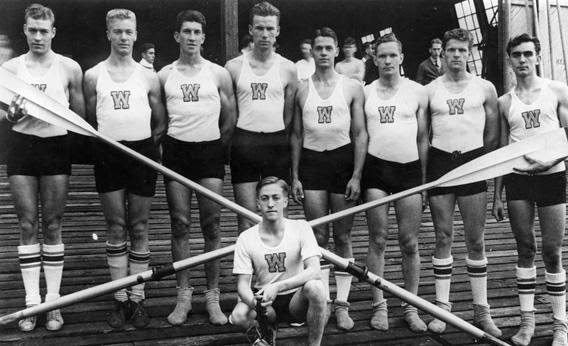 The first described the action from the 1936 Poughkeepsie Regatta, where Washington beat the University of California and other crews on their march toward the Berlin Olympics. The second selection was from the end of the book where Brown reflects on the exceptional group of boys they were and what they represented. Brown visited Grunau, the site of the 1936 Olympic crew races. The passage goes on to describe birds dipping their wings in the sun-glistened water, flying low, and then gone. Brown equates that image to all the young men (and women) of the Greatest Generation who accomplished the unimaginable, but went on about ordinary lives raising families, working at their careers, and then passed from this earth and into our memories. I don't know if there was a dry eye in the auditorium at that moment. I know we were both in tears as thoughts of grandfathers, favorite uncles, and dear friends now gone filled our hearts. The Boys in the Boat is much more than a sports book about crew racing, this is an inspiring story about determination, friendship, and teamwork. And ultimately it is a story about love. We both recommend The Boys in the Boat wholeheartedly. * Don co-authored this blog post with me today. I realize the poster is hard to read. Go to the SYNC website for better viewing and audio-clips. Get psyched! Muriel Donnelly, an old girl in her seventies, was left in a hospital cubicle for forty-eight hours. Dorothy started making breakfast. No oranges. Yesterday she had hobbled out to her greengrocer's only to find it had turned into a Snappy Snaps. Her own face, in the mirror, had been replaced by that of an old woman. Comment: I enjoyed the movie and didn't even know it was made from a book .until I was perusing a list of book club kits at my library. The book is actually quite different than the movie so I am not able to predict upcoming action. 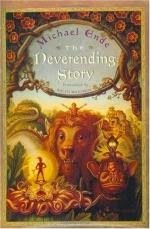 Writing a review for The Neverending Story by Michael Ende feels a little like writing a review for a Harry Potter book. Many people who haven't read the book have seen the movie (and remember it fondly) and, therefore, have no intention of going back to read the book. With this in mind I will give you the barest of summaries, in case you are the only other person in the world who hasn't seen the movie besides me, then I will focus the rest of this review on information on the author and what symbolism I could glean out of it. Summary: A young boy named Bastian Balthazar Bux is chased by his tormentors from school in to a bookstore. While there his is enticed to steal a very pretty book, The Neverending Story. He hides out in an attic at his school and begins reading the book. The plot then jumps to the story and back to Bastian. In the story we are introduced to a young hero, Atreyu, who is tasked with saving Fantastica from the NOTHING by locating a human child willing to enter the magical land to give the Childlike Empress a new name. The NOTHING is taking away all dreams and fantasy from the land. At some point while reading the book Bastian enters the story and he starts to recognize himself. He thinks it is an hallucination. But eventually he realizes that he is the human child who must go to Fantastica to save it. And after he figures out how to get in he finally does enter the realm where all kinds of fantastic adventures of his own making await him. 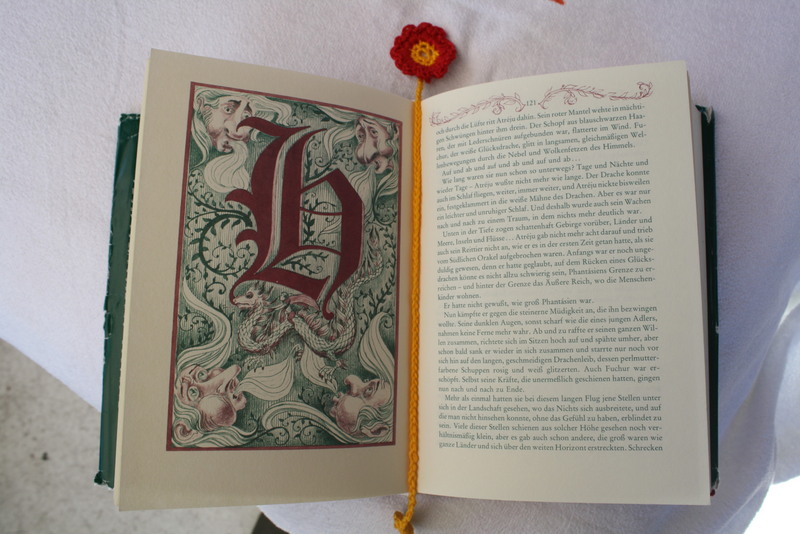 The book is divided in two parts: before and after Bastian enters Fantastica. Apparently the movie ends after part one so if you have only seen the movie then you really should read the book to get the full story! There. That is my plug for reading! One may enter the literary parlor via just about any door, be it the prison door, the madhouse door, or the brothel door. There is but one door one may not enter it through, which is the nursery door. The critics will never forgive you such. The great Rudyard Kipling is one to have suffered this. I keep wondering to myself what this peculiar contempt towards anything related to childhood is all about. Ende wanted his work to speak to the human condition, issues that children aged 8-80 grapple with. Born in Germany in 1929 he lived through the Nazi era. He was horrified by the war and action of the Nazis. His father, a surrealist painter, was deemed a degenerate by the party and so had to paint and work in secret. By the end of the war, though he was only 14, Ende was drafted but tore up his papers and worked for the resistance in the Munich area. Up until his death in 1995, from stomach cancer, Ende used his writing to shine a light on cultural and spiritual problems in the world, drawing upon his experiences from the war years. "Rich with symbolism, The Neverending Story is a classic children's tale designed to teach young people to come of age emotionally." Children might miss all the lessons because they are painlessly presented in fantastical imagery and wild tales of adventure. Bastian learns eventually that he has to accept himself and has to give up any preconceived ideas about himself (both good and bad) if he is able to move on and actually be any help to his world. I listened to the audiobook which was magically narrated by Gerard Doyle, who, if I am not mistaken, was the reader of the Eragon series. I have all kinds of pleasant associations with his voice, that is for sure! I wholeheartedly recommend it in this format, though, be sure to go back and look at the print edition which is divided into 26 chapters and each chapter begins with the corresponding letter of the alphabet. Very clever. Audio Edition: Tantor Audio, 2012. Borrowed from my public library. Pages read: 215 of 609. Weekly goal: I'm feeling pretty confident and accomplished. I met my goal of reading at least 17 pages per day on average. Surprisingly, it is a very manageable number of pages to read and I never felt like I had to read them but I did think, "Oh good, I get to read The Woman in White right now." I mentioned this last week but It was very evident in the sections I read this week, because the book was serialized each chapter ends on a bit of a cliffhanger or something that made me want to keep reading. Very clever. 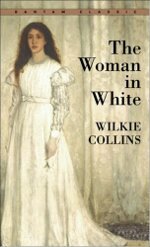 Wilkie Collins was most proud of this book and directed that the epitaph on his tombstone read: "In memory of Wilkie Collins, author of 'The Woman in White' and other novels." He was most proud of this novel, though he wrote many others. His novels are very atmospheric and he uses nature as symbols and signs for upcoming troubles. I am just at the part where the character talks about the suffocating effect of trees. I like trees but not if they are portents of death. The book is surprisingly readable and I'm enjoying my time with it. The plot just keeps getting thicker and the plot more and more sinister. Nothing terrifying has happened yet but I keep getting the feeling that it will at any minute. I am struck anew about the powerlessness of women in the 1850s. Decisions that are made that dramatically affect them yet their opinion is not considered. Collins writes as if this is normal. Comments: I'm starting to sound like a disciple but let me say this---the hardest part of reading classics in getting started. Just pick up one you've been wanting to read, set yourself smallish daily goals, and go! Ivan Doig, a favorite author, died April 9, 2015. 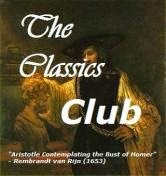 Classics Club Spin #9 starts today! Sunday Salon, April 5th. Happy Easter!